Tomorrow, 20 May 2014, Malawians head to the tripartite polls for what promises to be the country’s most contested elections since the first multi-party elections were held in 1994. President Joyce Banda, the former deputy president, came to power in April 2012 following the death in office of former president Bingu wa Mutharika. She will be among a record 12 presidential candidates, with 17 political parties and hundreds of independent candidates vying for the 193-seat parliament. Although the lack of regular and credible opinion polls makes it hard to predict the outcome, analysts expect a four-way presidential dogfight. Banda, representing the People’s Party (PP), will contend with the leaders of three former governing parties in the presidential race. They are Peter Mutharika of the Democratic Progressive Party (DPP), Lazarus Chakwera of the Malawi Congress Party (MCP) and Atupele Muluzi of the United Democratic Front (UDF). According to an Afrobarometer survey released on 9 May, of the 2 400 people sampled, 27% backed the DPP and its presidential candidate, 21% supported the MCP, 19% favoured the PP and 14% backed the UDF – while 15% said they were undecided, or refused to disclose their preference. The country risks for the aftermath of the election to turn violent if the Malawi Electoral Commission (MEC) does not rectify problems with the voters’ roll, which is believed to have been manipulated. Some candidates, for example, are said to have ferried voters to change voting districts. Some voters’ names appear to be missing from the voters’ roll, while others’ names incorrectly appear in Arabic. Such identity mix-ups could prevent some voters from casting their ballots. The total number of 7 500 000 voters that the MEC has registered has also been criticised by the Malawi Civil Society Grand Coalition as being inconsistent with the figures of the voting-age population from Malawi’s National Statistical Office. The Coalition fears the inflated figure could be used as ‘a launch-pad for rigging’. The importance of the voters’ roll as the key document for free, fair and credible elections cannot be overemphasised. There have been numerous complaints, both from election stakeholders as well as the public, that the MEC is not addressing rumours and allegations of rigging in favour of President Banda and her party. 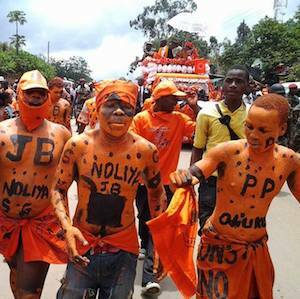 The PP has also reportedly benefited unduly from using state resources to boost its campaign. The Malawi Electoral Support Network (MESN), in its March 2014 Long-Term Observation Report, ominously warns that the country is gradually becoming a fertile ground for electoral malpractices and political confrontation. This could compromise the quality of the elections, which represents a concerning trend. The MEC acknowledged that the voters’ roll is in a shambles. On 25 March 2014, the election management body announced in a press release that ‘due to logistical challenges and inadequacies in the preliminary voters’ roll’ it had ‘decided to suspend the voters’ roll inspection exercise’. This was only a day into the exercise. The MEC’s Chief Elections Officer, Willie Kalonga, attributed the irregularities to a lack of competent managers. However, three of the country’s main opposition parties – the MCP, UDF and DPP – expressed concern over the suspension of the inspection, fearing the delay would affect the electoral calendar or that it might be a ploy by the MEC to rig the elections. Henry Chingaipe, a political analyst, noted concerns that the MEC was treating the election as an event rather than a process – and urged the electoral body to ensure that adequate preparations are made for the election to be free, fair and credible. Although the MEC purportedly rectified the voters’ roll and reopened the inspection exercise on 9 April, this has to a great extent been met with apathy. For instance, in most centres with more than 1 000 registered voters, fewer than 100 people have verified their names in the voters’ roll. Stakeholders, including the MESN, said the MEC had confused voters due to the change of programme and failure to publicise the exercise. The elections watchdog claims that the MEC is not making a serious effort to address the ongoing voters’ roll irregularities. The MEC argues that the low turnout was due to factors such as voter reluctance. According to regional and continental standards for democratic electoral processes, electronic and hard copies of the voters’ roll should have been released well before the elections. That the MEC has sought technical advice and equipment from the Zimbabwe Electoral Commission – which allegedly kept a doctored voters’ roll in the run-up to Zimbabwe’s 2013 elections – has also raised concern. It remains to be seen how the MEC will respond to the MESN’s call for an independent voters’ roll inspection to minimise complaints after the elections. The MESN, civil society organisations and other elections stakeholders, through the Malawi Elections Information Centre (MEIC), have provided alternative voter verification through Internet and mobile technology. Although Malawi has a history of peaceful elections, the risk of post-election unrest cannot be discounted. The Malawi Civil Society Grand Coalition fears the flawed roll could precipitate violence such as riots in major urban centres, and has urged the MEC to address criticisms of the roll. The 11 presidential aspirants – who are unanimously challenging Banda – have warned that if the elections aren’t free, fair, transparent and credible, this would result in a disputed outcome, which could have catastrophic consequences after the polls. On Saturday 10 May, at the National Day of Prayers event hosted by the Public Affairs Committee at Civo Stadium in Lilongwe, the 12 presidential candidates signed the Lilongwe Peace Declaration. The declaration urges them to accept the results of the elections, and uphold peace and order after the nation has gone to the polls. Regardless, it remains critical for the MEC to display a commitment to transparency. Otherwise Malawi, fondly known as the ‘warm heart of Africa’, could be faced with the chilling prospect of a troubled post-election period. Baldwin Chiyamwaka, Consultant, Governance, Crime and Justice Division and Gwinyayi Dzinesa, Senior Researcher, Conflict Prevention and Risk Analysis Division, ISS Pretoria.